The Parish Council and Allerton In Bloom Group would like to thank the following people and companies for their help and sponsorship in reaching our aims for the village. After 6 years hard work finally we have got a GOLD award for 2017, thanks to all the hard work of the members of the In Bloom Group. Also we have a judges discretionary award to come. In the first judging of this year we have been rated for a Gold award, a lot of hard work has been going on getting ready for the second judging which will take place on the 5th July we still need people to help us get ready for the day even if only an hour a week. Meadows cul- de - sac, Vickers Court. cover which will reduce maintenance and improve the overall appearance. all serve as a strong reminder of Allerton’s heritage. The entry was spotless throughout and planters had been improved since spring. winning poster to be used for next years In bloom publicity. Support from local business's including Valentines, and Papico's to note. Good to see new members since spring, continue to encourage others. Please click on the link above to open our latest leaflet. 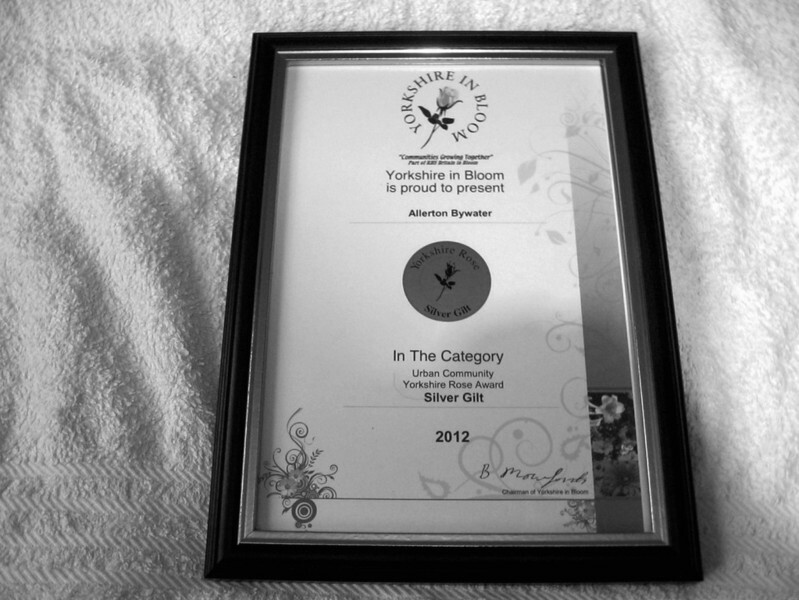 Please click the link above to find out all about Yorkshire in Bloom. Allerton Bywater in Bloom group will have a representative for you to talk to in the new annex of St Mary's the Less Church on the first Saturday of the month between 10am and noon at the same time as the Council surgery takes place. So please come along for a talk everyone is welcome. 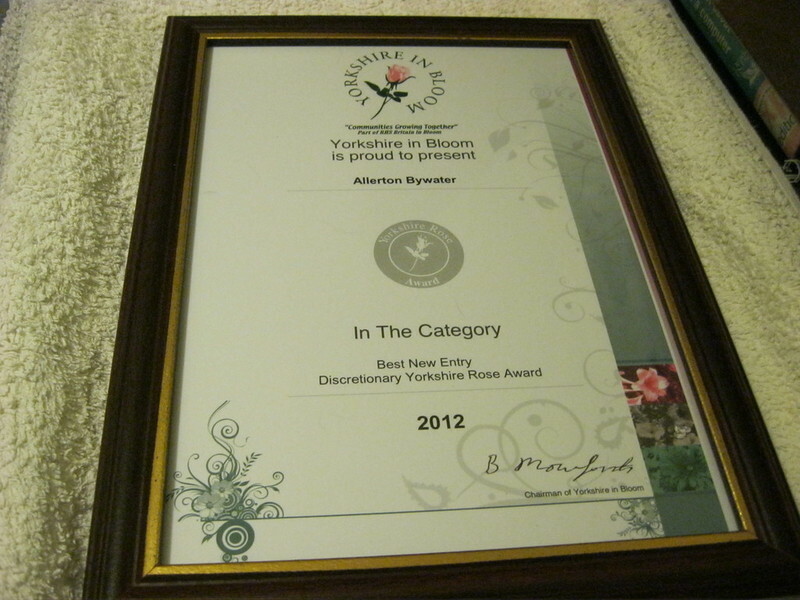 Yorkshire in Bloom criteria from Leeds City Council. Please click on the link above. Bus timetables & up to date traffic information. You must not use our website in any way which is unlawful, illegal, fraudulent or harmful, or in connection with any unlawful, illegal fraudulent or harmful purpose or activity. The majority of content posted in this forum is created by members of the public. The views expressed are theirs and unless specifically stated are not those of Allerton Bywater Parish Council. We accept no responsibility for any loss or harm incurred. THE STREETS OF ALLERTON BYWATER HAVE BEEN DESIGNATED AN ALCHOHOL FREE ZONE. THIS MEANS IT IS ILLEGAL TO CONSUME ALCHOHOL IN THE STREETS, THE POLICE HAVE THE POWER TO TAKE THE NECESSARY ACTION AGAINST ANYONE CONSUMING ALCHOHOL IN THE STREETS. An Environmental officer now patrols the village on different days at differnet times, watching for people who do not clean up after their pets, fines have already been issued. be warned! the more information you can give the better, names,addresses,dates,times and reg. numbers of vehicles etc. We all love our dogs, we ask you to take a plastic bag with you and clean up after your dog, then put the plastic bag in one of the many bins sited throughout the village. Also remember the health risk to us all from Dog poo. REMEMBER BAG IT & BIN IT, IN ANY STREET LITTER BIN!